This will be a quick one as I’ve been rather busy this weekend. There will possibly be a longer one about starlings later in the week or on Sunday. Zimmer et al. wanted to find out if adaptations in behavioural budgets as a response to predation were really as simple as “eat less and be more vigilant” so they scared three different species of ducks with a radio controlled car. 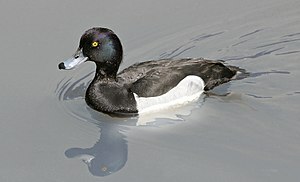 These were captive ducks reared at farms and they always had food available in their enclosures, which makes the study slightly limited in applicability to the wild. However, so long as this is kept in mind, there is definitely something interesting going on. Here’s the shocker: The birds did not spend more time being vigilant during the week of being chased by a radio controlled car than they did before and after. They did eat less, though, but it seems they spent more time sleeping and not being vigilant. This is interesting, but I’ll get back to that. I should mention that the ducks they used were mallards, teal and tufted duck and that there were some differences between species, but I think you should just find out about those differences by reading the article, if you’re interested. Now back to the interesting bit. So the scared ducks slept more. Hmmm. Now, there is something I didn’t know about ducks, and that is that they this thing called vigilant sleep. Basically, they wake up every now and again to look around. This means that they’re not at as high a risk as you might think while they’re sleeping. They also ate less. This can have several not-so-obvious advantages, that become obvious when you think about it. First of all, these ducks always had food available to them, so they were in no risk of starving to death. They still ate less (and lost weight), but this could be an advantage. A lighter duck is a better flier and can therefore escape with more ease than a heavy duck. It seems like the ducks went on an intentional diet as a response to being afraid of predators. The reduced feeding could also go some way to explaining the increased sleeping. Obviously, the ducks use less energy when they are completely still, so this conserves energy. Also, an animal that is completely still is harder to spot than one that is moving, again making the ducks less likely to be eaten. This is basically what the authors discuss in their discussion and although I don’t really know about the whole vigilant sleep thing, their reasoning seems sound. They conclude with mentioning that we should know if the behavioural patterns change at night… well, yes. I can’t believe they didn’t do that in the first place. Maybe the ducks just spent less time eating at day and more at night. On the other hand, they did lose weight and ate less food according to unpublished data by Zimmer. All things considered, though, they really need to look at how the ducks behave at night. They should also find out whether it matters when their remote controlled car predator comes after them. They may respond differently if the attacks happen at night. Hi, Freya, just found your blog – good to see another behavioural ecologist out here in the wilds of the internet! Interesting duck paper … the concept of “vigilant sleep” is new to me, but it bears some thinking about. The first thing that popped in my head was dolphin sleep patterns, honestly; maybe there’s something in their foraging patterns that parallels what the authors were talking about here? Hello Steve 🙂 Nice to meet you. I found your blog via the tag surfer on the WordPress dashboard, and you’re right. There aren’t many of us. I’m not on Twitter, but I keep being told that I should be. My supervisor even sent me a link to a blog post by someone else looking for science bloggers on Twitter. Maybe I’ll join. Let me know about other ecology bloggers out there, yeah? I’ll put them on my blogroll. Oh, and my first thought on vigilant sleep was dolphins too!